All is well … but my body just didn’t hold up like I wanted it too  Lots of experience to build on (got to be positive here). I basically ran out of “gas” on the 2nd day at Graford and called Lynne to pick me up. We did go on towards Graham and had dinner at a beautiful place called Wildcatter Ranch and then came on home. Leaving out I weighed my gear which totaled up to be 51 lbs. L/R Rear Paniers: 13.5 L Front: 10.8 R Front: 8.6 Handlebar Bag: 4.8. 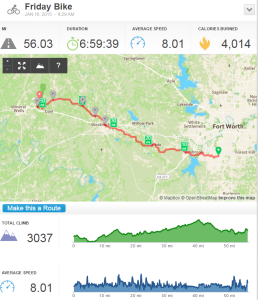 Took off from house about 8:30 Friday from my house and had a nice ride along the Ft Worth Bike trails and on to Aledo. As I approached Weatherford there were a couple of hills that I actually had to walk up. This was my first sign as I’ve ridden this route several times before and didn’t have any problems. 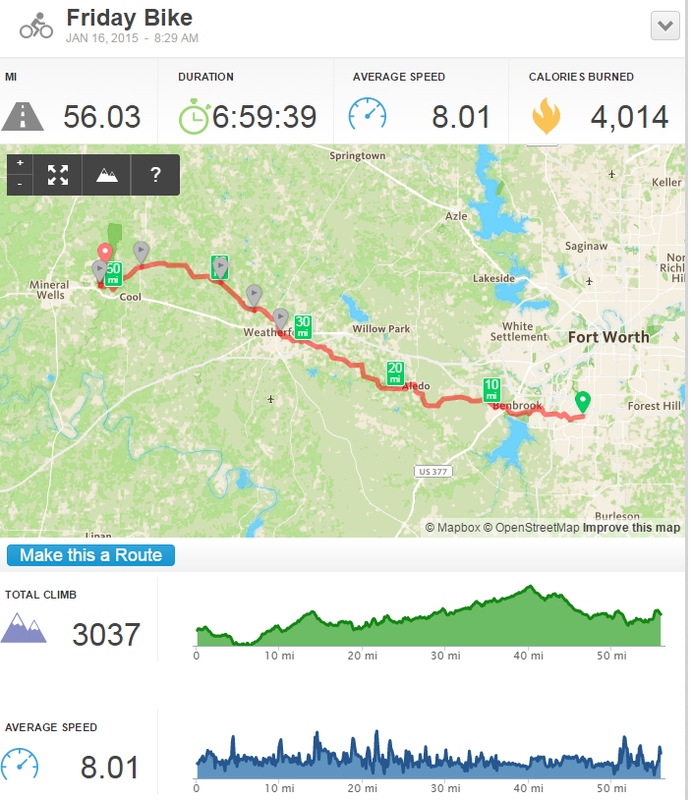 Once I reached Weatherford, I took a break at the First Monday grounds area and grabbed a granola bar. Nice area with picnic tables, public restrooms, etc. Took a few pics of the bike there. All in all, my cooking gear, stove, tent, sleeping bag, pillow, etc … all worked VERY well for me. I was off to meet my brother Mark to have breakfast at the McDonalds’ along the bike trail. We connected up at about 8:45 and the road on into Mineral Wells passing by the helicopter for a photo opportunity. My older brother Jack also met us there. It was great to have breakfast with my brothers and their concern for me and my adventure. Bro Mark was showing me a weather forecast of a dry cool front coming in and the wind direction was going to be coming from the North but I thought I had some time before that happened. Boy was I wrong! Headed on out after breakfast to catch highway 180 and then to highway 337. That’s when the wind started hitting me! 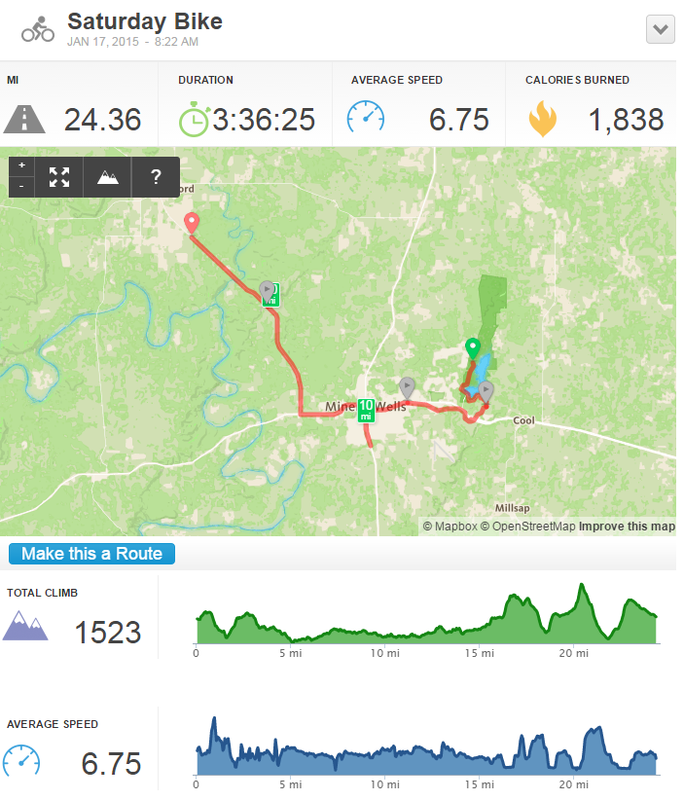 Along with the wind, making a wrong turn, and my knees hurting I knew it was going to be a long day. After going about 15-20 miles, the hills were extremely steep and I was walking them all. Then when going downhill, I was having to pedal just to keep moving against the wind … and my body was just not keeping up. I stopped for about 3 miles south of Graford to rest and decided to go on to Graford and call Lynne. 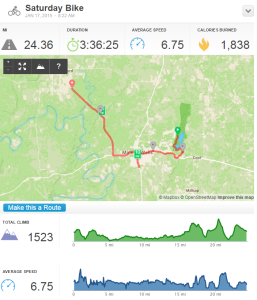 So Saturday’s totaled about 27 miles before I gave up. Lynne and I drove onto Graham area where I stopped by the RV park to tell them I’d not be staying but hoped to in the future. We then head 3 miles south of the RV park to a place called Wildcatter Ranch where we had a nice dinner together enjoying their fabulous views! Got on home at about 8:30, showered and the bed!